Transfer deadline day is normally associated with football clubs, but Redwing Coaches has extended this occasion to the coach industry in the last few years by using it to announce its new vehicle orders on its social media pages. 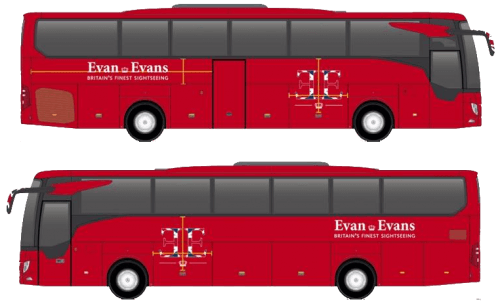 The latest additions to the fleet will be eight Euro VI specification Mercedes-Benz Tourismos for its Evan Evans Tours contract, which operates daily tours from London to tourist attractions such as Oxford, Bath, Windsor, Stratford-upon-Avon, and Stonehenge. The 53-seat coaches will feature Durabright alloy wheels, USB charging points, three-point-seatbelts, and two 19-inch monitors. The new Mercedes-Benz Tourismos will replace the previous generation model that were new in 2015. Delivery is expected to commence in the coming weeks.